New data from the IDC has been released, indicating that Google's app service is catching up to the Nintendo 3DS and PlayStation Vita as far as user spending goes. 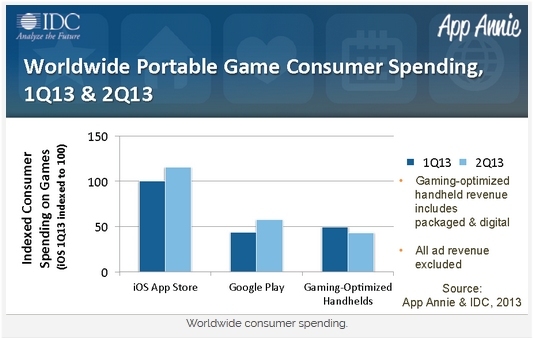 But there's no reason to count out the portable gaming devices just yet. According to a report from Dazeinfo, the IDC has released their latest data regarding app spending in the portable and mobile space, and some of the charts are very telling. As you can see in the image above, it appears as if Google was trumped in the first quarter of 2013 but then managed to fire back during the summer months to churn out some massive app revenue and edge out over the PSV and Nintendo 3DS ever-so-slightly. While many sites would spin the news that mobile is finally crushing dedicated core gaming, it's still so very far off from the truth. 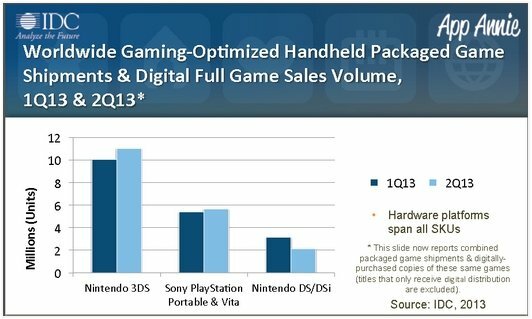 First, take into consideration the saturation difference between smartphones and dedicated handhelds, as well as the amount of apps and the app prices for these goods, and at what volume these goods move in comparison to portables such as the Nintendo 3DS or PS Vita and then you get a slightly better idea of what's what. In fact, throughout the second quarter there were more than 187 million Android-based phones shipped, according to a report from CBS News based on more data from IDC. Consider that the Nintendo 3DS has a saturated base of around 33 million units and the PlayStation Vita sits at the 5 million mark. In the case of the Vita, Sony's handheld makes up for less than 3% of the install base of Android smartphones in the second quarter of this year alone, yet revenue and app-based purchases are still very similar in regards to user engagement. This practically shows that a smaller pool of dedicated gamers are spending way more per every quarter in the portable gaming space, than a larger pool of casual consumers in the vast smartphone arena. More than anything, these numbers are absolutely embarrassing for Google Play given the amount of users who have OS-compatible smartphones but are barely spending more on apps than a dedicated portable that makes up for less than 3% of the userbase. Yeah, I'm thinking I should have renamed the headline to “Google Play Gets Relatively Stomped By Nintendo 3DS and PS Vita In App Sales”. 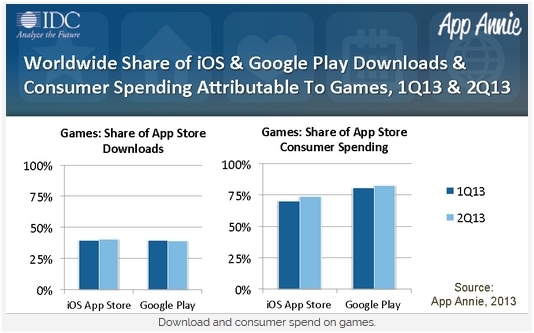 * Game apps now represent almost 40% of all downloads on both the app stores. * Game apps represented over 70% of app revenue on both app stores. * The data includes all applicable smartphones and tablets, including the iPod touch.